Indian naval ship (INS) Vikrant, the first aircraft carrier, which played a pivotal role in the 1971 Indo-Pak war, has made its way into a commuter bike to be launched by Bajaj next month. The Pune-based, India’s most valued two and three wheeler maker, will launch a 150cc motorcycle on February 1 christened ‘V’ which is built from metal used in the country’s most celebrated aircraft carrier. This will be the eight product by Bajaj Auto this financial year and the first in 2016. ‘V’ is a new brand by the company complementing five of its predecessors in production. This new bike, which has a slight retro look as seen in the sneak preview aired on Tuesday by Bajaj, is expected to be positioned between the Pulsar and Discover. However, further details including its price would be known at the time of its launch. The bike will sport a special logo to commemorate the aircraft carrier. INS Vikrant was commissioned as the first aircraft carrier of Indian Navy in 1961. After years of distinguished service, she was decommissioned in January 1997 and served as a museum till 2012. 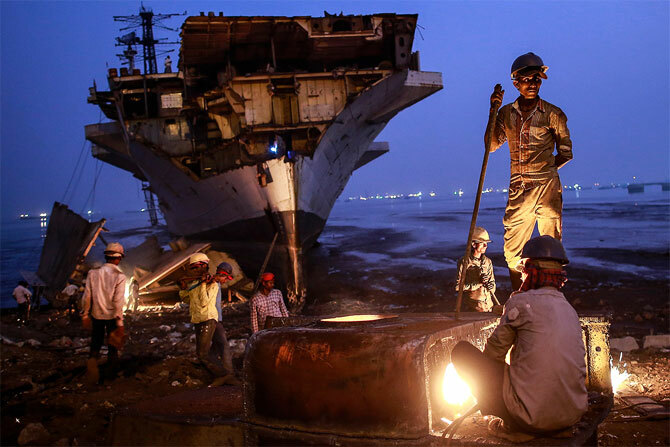 In late 2014, Vikrant was dismantled and sold as scrap metal. Bajaj Auto purchased the Vikrant metal and processed it to be a part of its new brand. “The new bike will therefore preserve a significant piece of Indian military history”, added a Bajaj Auto statement. “For the warship, the name Vikrant was taken from the Sanskrit word Vikr?nta meaning "stepping beyond", i.e. "courageous" or "bold". These qualities also form the essence of our new brand. We are confident that the bike will carry the spirit and legacy of INS Vikrant forward and become one of the most path-breaking motorcycles that customers will witness this year,” added Vas. In 1957 Indian purchased HMS Hercules, an incomplete aircraft carrier from the British Royal Navy and commissioned it in 1961. The carrier saw two wars with Pakistan, 1965 and 1971 where it played a crucial role in isolating Pakistan Naval Ships during the war of independence of Bangladesh. Vikrant is also the name of India’s first indigenous aircraft carrier being built at the Cochin Shipyard for the Indian Navy at the cost of nearly Rs 20,000 crore (Rs 200 billion). POLL: Did Aamir Khan damage India's brand identity?